This review first appeared in the April 26 edition of the American Reporter. Charlie Musselwhite has been to purgatory and back. After starting off on Vanguard Records in the mid-'60s, he ended up on small blues labels like Arhoolie and Alligator throughout the '70s and '80s. Now, once again, he's on a major label  Virgin's Pointblank blues imprint. 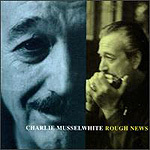 No doubt, his years on the small labels gave Musselwhite more freedom to hone his chops, and he is today one of the top blues harpists around  along with James Cotton, probably the two finest harmonica blowers on the scene. On his latest album, Musselwhite shows that there is far more to great playing than speed and dexterity. He has a finely developed sense of timing and taste; his solos may not be the fastest, but his tone and inflection are even more able to convey his passion. As a singer, Musselwhite is more limited. His rough, gravelly voice is adequate only by the broadest definition of that word. "Rough News" features a variety of different backing musicians, the most notable names being on guitar: underknown Fenton Robinson and Kid Ramos, Junior Watson and Los Lobos' Cesar Rosas (who also produced several cuts). Musselwhite wrote a handful of the songs here, but most are covers of songs by other writers. The style of music reflects the variety of writers, ranging from jazz to Chicago blues to Brazilian to rock. It's good stuff, though, all of it.